Do any of you remember this lady from What Not To Wear (aka my favorite show when I was in college)? 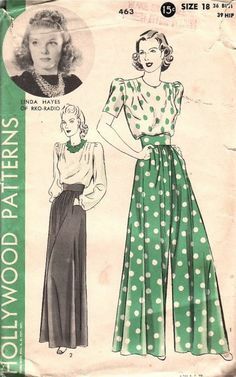 She showed up with these “hostess pajamas” that her mother-in-law had given her because every Southern woman needed a pair. Stacey and Clinton trashed those gold leggings and matching top in a hurry. It turns out that hostess pajamas are a real thing! As the name states, they are pajamas you would wear when you were hosting. Of course these aren’t a ratty flannel pants matching with a holey tee-shirt sort of affair, but rather wide comfortable pants and a loose blouse. And you would wear them for more casual types of hosting, in your home. The reason you could wear these “pajamas” in your home was that the hostess was almost always more casual that her guests. For example, in the hat wearing days, women would always keep their hat on when visiting, but the hostess would never wear a hat in her own home. An alternative thought about hosting pajamas is that they would be what you would wear around the house in the daytime so you could be comfortable but still presentable to any guests that happened to drop by. We should really bring this back- I don’t know about you, but I hate running to the door to accept a package from UPS when I am in something old, with no bra, and ratty hair.